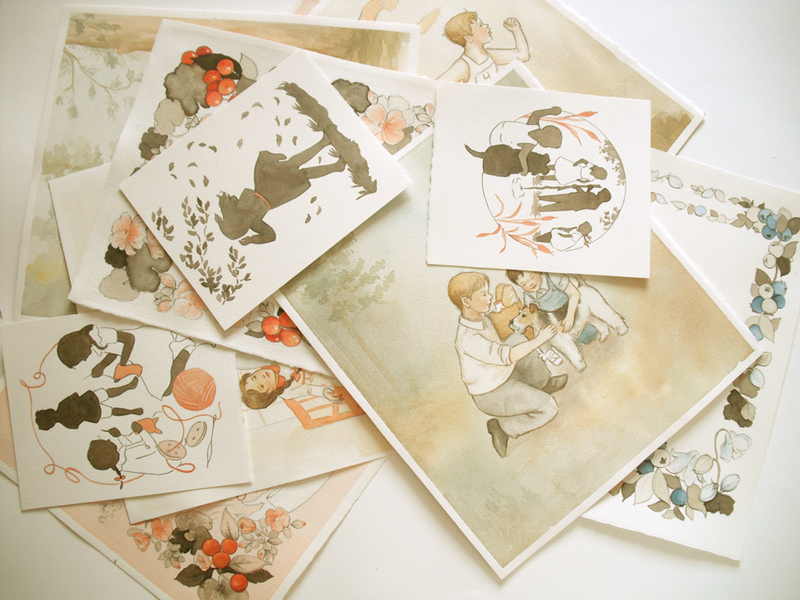 So you have no doubt seen a lot of little snippets, bits and bobs and pieces of my work lately. Well, all of these little glimpses have been a part of a larger picture, and I have been pursuing my dream of storytelling: I have illustrated a book! I'll share more details in the weeks to come, but until then I want to savor a beautiful melancholy-ness in my heart. This pile represents all of the days, and minutes, and months, and weeks that I have joyfully poured into my first book. It's a wonderful feeling to actually be able to reach out and hold a piece of time like this! I can not wait until you, too, can hold this tangible form of time. I've been using a very limited palette for these silhouettes, and having great fun with the pops of red! I must admit, I love a good yarn... Can't wait to put all of these together! Part Three of "Showing Paintings Without *Actually* Showing Them". Stay tuned for the subsequent sequels! Pink may be most every little girl's favorite color, but it can also be so sophisticated and elegant. It's definitely a color that will grow up with you. Just an observation as I have been painting through rose-colored glasses lately, and I'm happy to report that I like what I see! I may be painting many shades of blue, but I've never been happier... 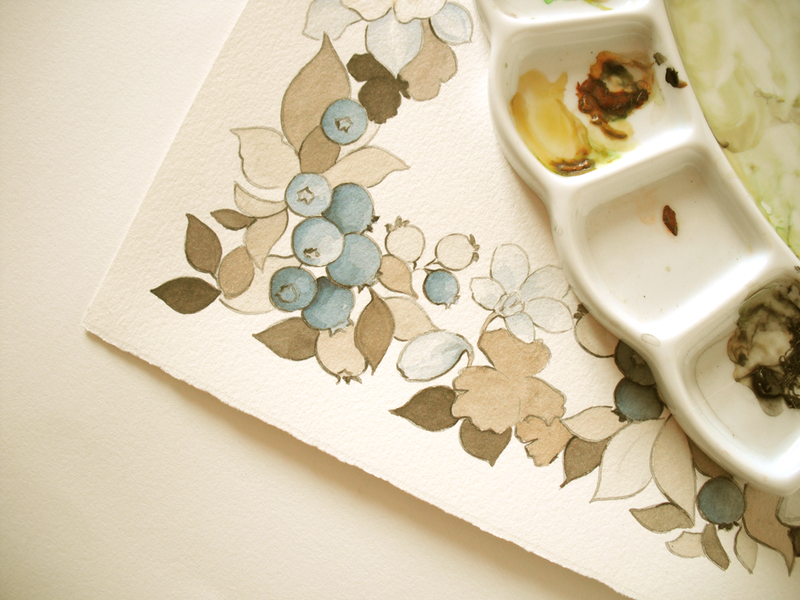 Thus, the equation I've just discovered: Blueberries, and blue columbines = this illustrator's happy pink cheeks! 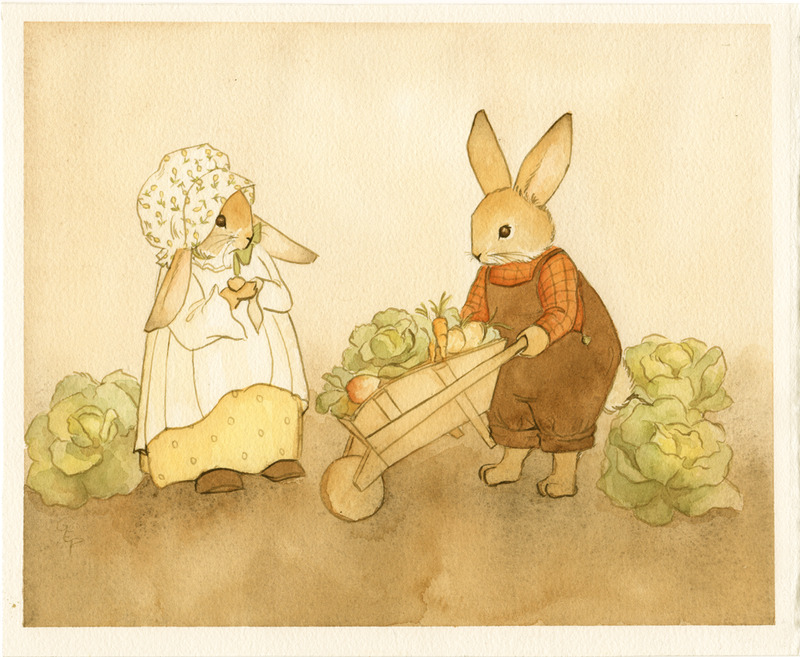 Farmer O'Hare and Bonnie Bunny are busy gathering and working in their garden. I've fallen in love with these two characters, and I can guarantee that you will be seeing a lot more of them in my coming work! 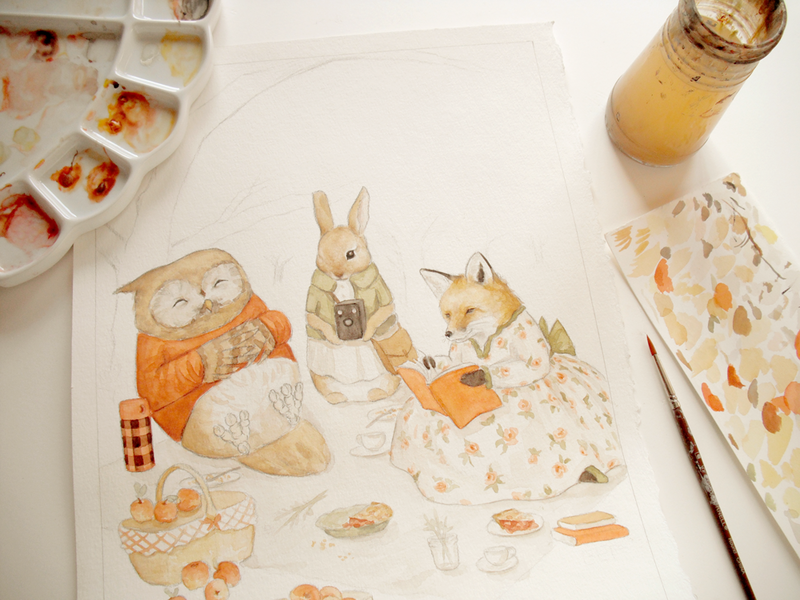 Also, my thoughts are officially on spring now thanks to this fun little picnic taking place. Sketching in the wee hours by lamplight. Fueled by cup after cup of Tetley tea. Many apologizes for the silence I have been exhibiting the past month, but there have been a great many things that I have been working on that must remain under wraps. Secrets can be fun, and other times I wish I could let the cat out of the bag! Anywho, I am getting a late start on Inktober, but am participating none the less! Here is a corner of a bird and floral piece I have been drawing this afternoon. 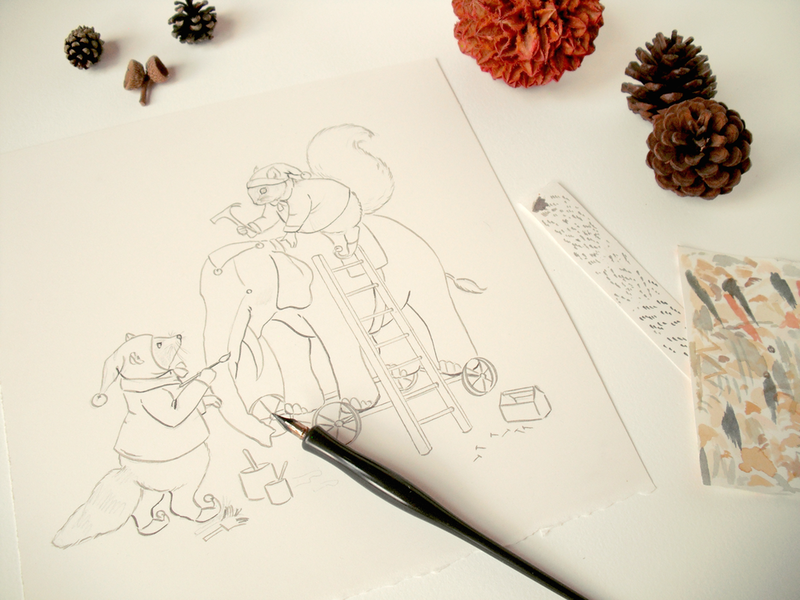 More inking to come in this lovely, beautiful, dreamy brisk month. My favorite of all the calendar year... October! Here's to the wind, the apples, the leaves, the cinnamon, and pumpkins, each one chock full of magic and full of childhood delights I shall never outgrow! The humble beginnings of a little mouse. A little afternoon painting from my sketchbook... I love making new friends. A drawing from my sketchbook, featuring two friends, an umbrella, and a jolly rain cloud.